Aqueous acrylic polymer emulsions are replacing solvent-based polymer systems thanks to environmental regulations limiting volatile organic compounds (VOCs) and major improvements in the performance characteristics of the emulsion-based products. Advancements in film mechanical properties; chemical, water, and abrasion resistance; durability; adhesive properties; and solvent resistance have further driven the growth of waterborne acrylic technologies. And a major contributor to these performance enhancements has been new polymer crosslinking chemistries. In this article, we’re going to look at the best crosslinking technology—crosslinking chemistry based on diacetone acrylamide (DAAM) and adipic acid dihydrazide (ADH). This technology is known as keto-hydrazide crosslinking because it involves the direct reaction of the pendant ketone moiety on the DAAM segment with the hydrazide moiety of the ADH. After examining the benefits of this system, we’ll then look at several coating applications of DAAM and ADH. The DAAM-ADH crosslinking system provides a number of benefits for consumers. From reducing safety concerns to improving performance properties, the benefits of these intermediates are numerous. DAAM and ADH are easy and safe to use. Both intermediates are formaldehyde free. Wet acrylic emulsions based on diacetone acrylamide with ADH in the aqueous phase, are initially non-reactive and afford emulsions with good long-term stability during shipping and storage in retail containers (i.e., “in-can” stability). Because crosslinking is post-coalescence, the resulting three-dimensional polymer network exhibits enhanced mechanical strength and durability as well as maximum film cohesive properties. Crosslinking with the keto-hydrazide chemistry enhances abrasion, scrub, stain, and blocking resistance; moisture and solvent resistance; and substrate adhesion. With other crosslinking chemistries, premature crosslinking occurs within the emulsion particles prior to coalescence, thus retarding intermolecular diffusion between emulsion particles and resulting in weaker film products and coatings. This is particularly the case when diacrylates are used in the copolymerization recipe to produce crosslinks. With the keto-hydrazide chemistry, crosslinking occurs post-coalescence, allowing good molecular inter-diffusion between emulsion particles as the film dries, which enhances film properties. The circled moieties in the chemical structures below highlight the business end of these two molecules. The diacetone acrylamide monomer is soluble in water and most organic solvents, so it is readily incorporated into polymerization recipes. Self-crosslinking chemistry between diacetone acrylamide and adipic acid dihydrazide begins with copolymerizing DAAM into an acrylic copolymer, using DAAM concentration at ~1-5 wt. % of the monomer mixture. This makes the emulsion copolymer crosslinkable via a pendant ketone carbonyl moiety. The emulsion is neutralized with ammonia, and adipic acid dihydrazide (ADH) is then added to the emulsion as an aqueous solution. The ratio of DAAM to ADH is ~ 2.1 to 1.0. 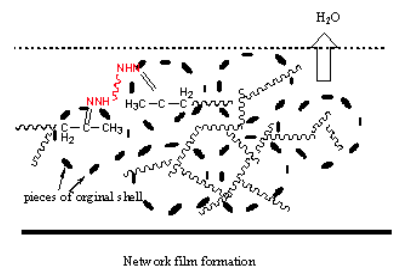 On drying off the water and evaporation of the ammonia, coalescence of the film occurs, and the pH decreases, becoming acidic. As the pH decreases, the crosslinking reaction rate begins to increase. 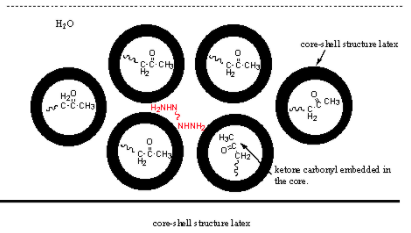 The crosslinking process then takes place (acid catalyzed) with the formation of a chemical bond between the DAAM and the ADH, called a ketimine moiety. The reaction by-product is water. 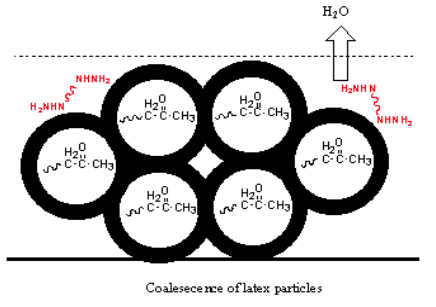 See the depiction of the coalescence and the crosslinking mechanisms below. The monomer composition is often dictated by the desired Tg (glass transition temperature) of the polymer film, from -30 °C to > 30 °C. Please see the reference Tg values of several key monomers provided below. To see examples of emulsion compositions you can use for copolymerization with DAAM, please consult the following recipe and tables. Key performance characteristics are shown to exemplify the attributes of DAAM-ADH crosslinked compositions. Self-crosslinking diacetone acrylamide self-crosslinking can be used in multiple applications, the most prominent ones being durable interior and exterior paints as well as coatings for architecture, wood, and concrete surfaces. Keep on reading to discover how to formulate a DAAM-based coating as well as its performance qualities. DAAM content is 2 to 5 wt. %. The polymer composition can be MA/MMA/BA/DAAM. ADH is about 0.8 N per DAAM. Drying conditions: 23 ˚C; 7 days. 2 Substrate was a fir plank. Temperature conditions: 60˚C x 2 hrs. to 20˚C x 2 hrs. As you analyze diacetone acrylamide's performance in the table below, note how DAAM has a significant impact on stain resistance. To evaluate your diacetone acrylamide coating, you’ll want to wipe the wood with a tissue. Then, 18 hours later, wash the wood surface with water. 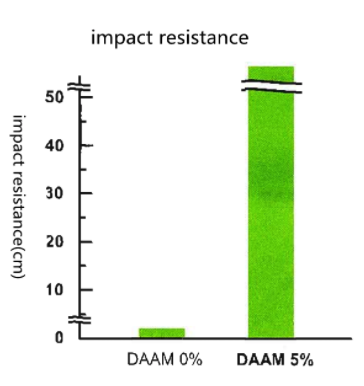 To see how DAAM enhances the impact resistance of wood surfaces, take a look at the chart below. Notice the high-impact resistance of wood coatings with 5% DAAM versus those with no DAAM. 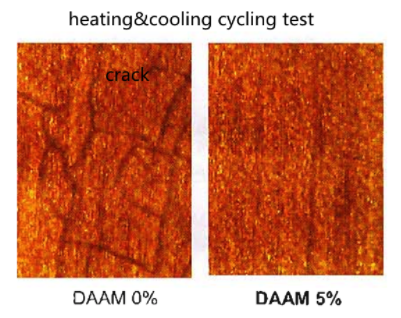 In addition, during a heating and cooling cycling test, coatings without DAAM can tend to crack. However, with a diacetone acrylamide coating, this is less likely. Check out these pictures to see the difference. ADH is 0.8 N per DAAM. The table below provides some key information on how diacetone acrylamide impacts concrete surfaces once applied as a coating. 3 Spray the Carbon Black or sand on the film surface, then scrub the surface with a brush after 30 minutes. Check residue on the film surface. As you can see, resin formulators use DAAM and ADH monomers in self-crosslinkable emulsion polymers for good reasons. In addition to both safe and convenient handling, this crosslinking system enhances mechanical properties, stain resistance, toughness, impact resistance, scrub resistance, adhesive properties, and more for multiple applications. If you’re ready to leverage DAAM and ADH for your organization, Gantrade maintains good inventories of both intermediates that are high quality. In addition, we readily provide product information, technical support, and product sales information so you can make an informed decision. Whether you want to know more about the capabilities of DAAM-ADH systems or you want to understand the inventory options we offer, contact Gantrade to speak with one of our team members.